I don't really care for sweet potatoes. I much prefer red potatoes if I'm going to eat potatoes. And yes, I know that they are so good for you. And I even feed them to my babies when I'm making their baby food, but I've never really enjoyed them for myself. 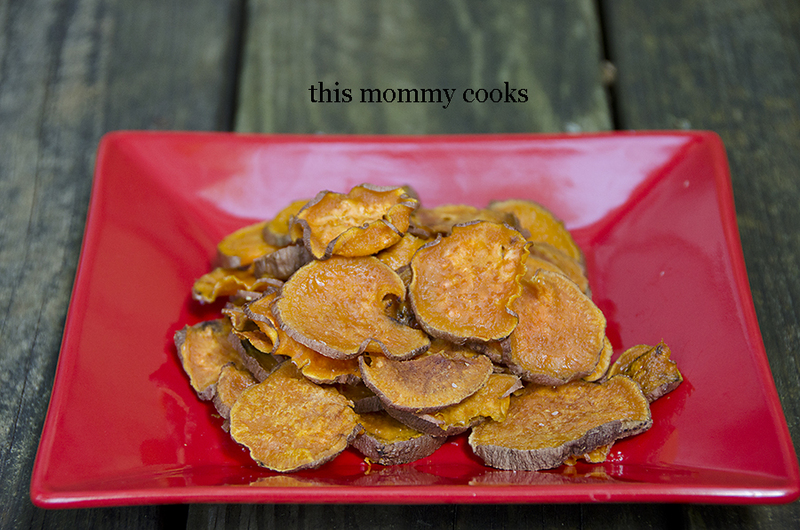 Last week, I found myself with two sweet potatoes that needed to be cooked. I wanted to try something new, so I made these chips or slices more in my case. I dipped them in blue cheese dressing while they were still warm and I finally figured out how I could actually enjoy eating sweet potatoes. They were so good! Scrub the potatoes, remove blemishes and pat dry. Using a mandolin or knife, slice into very thin, round pieces depending on the thickness preferred. In a large mixing bowl, add sliced potatoes and oil, toss to coat. Spray cookie sheet with non-stick spray, place potato slices next to each other until the cookie sheet is filled. Sprinkle with salt. More than one cookie sheet may be needed. Make sure to rotate them half way through if you are using more than one. If using only one cookie sheet bake on the middle rack. Bake for 40 minutes, turn potatoes over and bake an additional 40 minutes. If the edges are crispy remove from oven, if not, bake an additional 2-3 minutes or until lightly browned and crispy around the edges. The potatoes will shrink quite a bit. Allow potatoes to cool at room temperature. Chips will continue to get crispier as they cool. Store in an airtight container for up to 3 days. Note: I don't think I baked mine long enough, they weren't "crispy," but I loved them. I dipped them in blue cheese dressing while they were warm and it was heavenly. You have got to try it! Bookmarking this--Especially love the blue cheese addition. Yum! We LOVE sweet potatoes (I fell in love with them at Cafe Eclectic - a restaurant that opened in Memphis after you moved). Thanks for this super easy recipe; I'll add it to my list! Sweet potatoes pair very well with cumin, so if you wanted to dust a little on with the salt, I think that would be great.